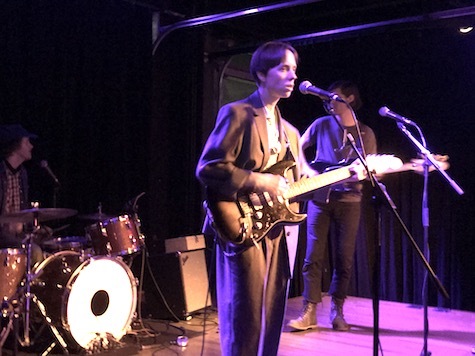 Hand Habits at Slowdown Jr., April 1, 2019. Sara Beth Tomberlin — or just Tomberlin as she’s known professionally and Toblerone as I sometimes mistakenly call her — sat center-stage at Slowdown Jr. last night with an acoustic guitar balanced on her crossed legs and sang heart-breakingly sad personal-journey songs in a voice I can only describe as “angelic.” You’d expect someone who writes such painful lyrics to be church-mouse quiet between songs and mumble morose thank you’s but instead, Tomberlin was a natural crack-up, talking about the time she was on the Jimmy Kimmel show during a bomb threat and how long it takes to get to the nearest Target from her hometown (hour and a half). 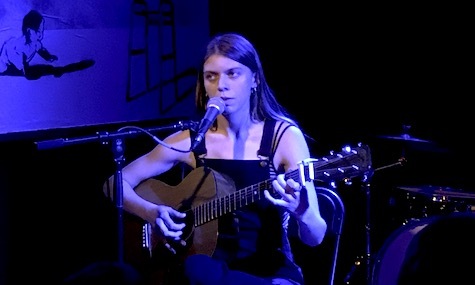 Tomberlin at Slowdown Jr., April 1, 2019. She sang songs off her Saddle Creek debut as well as a couple new ones that fell into the same solemn territory as the others. She thanked the crowd for being so quiet — the audience of around 60 stood as if in a trance throughout, except for two younger audience members who did a modified grind dance to every sad song. By contrast, Hand Habits was a veritable rock show. Playing as a trio with bass and drums, Meg Duffy led with an electric guitar that broke away a few too few times for soaring solos that would make Richard Thompson proud. Duffy’s guitar work was stellar and I wished they’d work more of those solos into the set. Instead, the band played mostly by the numbers songs from their latest Saddle Creek release, Placeholder, which is an early runner for my 2019 top-albums list. On the record, Duffy’s voice sounds like it’s always in harmony with someone or some thing. Live, the drummer added gorgeous harmonies, but for the big single, “Can’t Calm Down,” Tomberlin came up to the stage for one of the night’s highlights. I can’t quite put my finger on who Duffy reminds me of, and I suppose they’d appreciate that (I’ve yet to meet a musician who likes being compared to anyone). That said (haha) I was at times reminded of Aimee Mann, at least in terms of the way Duffy and company made the most out of simple compositions for maximum emotional impact. Not surprisingly, both acts said they were happy to be playing home base for Saddle Creek Records, whose reps were sprinkled throughout the audience, proudly watching their latest signees knock them dead. Huge show tonight at fabulous O’Leaver’s. Laura Jane Grace of Against Me! is playing with her band, The Devouring Mothers. Advanced tickets to this show are long gone, but there may be a few available at the door for $22.50. The door is at 6:30, so if you’re interested, you’ll want to get in line well before than. The show starts at 7:30 with opening sets by Mercy Union and Control Top. Also tonight, guitar virtuoso Rob Noyes performs at Reverb Lounge. Joining him are Jon Collin and our very own David Nance. $10, 9 p.m.